One of our favorite time-saving helpers is Zapier, which allows you to set up “Zaps,” or automations, for tons and tons of programs. Zapier is awesome and super easy to use…even if you aren't tech-savvy (only one of our team members is a techy guru, but we all can use Zapier). It walks you through step-by-step how to set up your Zaps and even tests them out to make sure they are working as they should. We’ve been using Zapier for the past 7 months and we’d be lost without it! The zaps we’ve set up save us time every single day, which means more time to develop products and ultimately, more time with our families. Ellen, our Brilliant Business Moms resident genius, made a tutorial video for you that walks you through some handy zaps for Pinterest (and you know how much we love Pinterest and use it to grow our business every single day) that will automate some of your more tedious business tasks. Set this Zap up if you want your new WordPress posts to be pinned automatically. You choose the board and Zapier does the work. This Zap uses the featured image for your post, so if your theme uses a vertical featured image and you want to automate some of your Pinterest sharing, this Zap would work great for you! Make sure your featured image with your theme is vertical. Make sure you have your alt-text filled with quality keyword phrases in a conversational tone. Use this Zap to automate your social media sharing. You select certain boards and any content you pin to these boards will automatically get added to your Buffer queue. When this Zap would be good for you: You use Buffer to schedule your social media content. And you love browsing Pinterest and pinning there, but it feels like a HUGE chore to schedule some of your other social media content. This is a fantastic way to re-use content across other platforms, especially if you spend a lot of time on Pinterest. You can take those fabulous pins you find and auto-populate sharing on FB, Twitter, etc. You can also team up with others in your niche. If you have a few close friends who own businesses similar to yours that you’d love to share content from, you can use hook up this Zap to one of your group boards and it will automatically fill your Buffer queue with great content. The description on each pin is the text that gets pulled when it’s shared to other social media. -You’ll want to either make sure the pin description matches what you want to say when you’re sharing it on other platforms, or you’ll need to go into Buffer and edit those posts. Jump to 5 minutes, 30 seconds in the tutorial video above to see exactly how to set up this Zap. Remember when we interviewed Laura Roeder, the creator of Meet Edgar? While we don’t use Meet Edgar ourselves, it’s an incredibly powerful social media tool that can save you loads of time and effort on social media. And when you mix Meet Edgar with Zapier, you can save even more time! When this Zap would be good for you: You use Meet Edgar already or are planning to. You love browsing Pinterest and want to fill your Meet Edgar library with the content you find there. Key Points: Like the Buffer zap above, the description on each pin is the text that shows up when you’re sharing on other social media. This zap is a handy tool to create a log of fabulous content. It works well to save time on your social media or to communicate with a VA. You can do this for particular boards or across your whole account. When this zap would be good for you: If you want a list of great content you find on Pinterest to use elsewhere, like roundup posts or to manually schedule for other social media, or you’re working with a VA who schedules for you, this Zap would be a great tool for you to use. This Zap automatically pulls new content from an RSS feed and pins it onto a board of your choosing. When this Zap would be good for you: If you’re looking for a quick way to automatically pin new posts from your blog, or if you have some fantastic blogger friends in your niche that you are always pinning from, this might be the perfect Zap for you! Setting this up will automate your Pinterest sharing so every time there’s a new post, Zapier will take it from the RSS feed and pin it to your account. Key Points: Remember that images matter! Test out this Zap to make sure it correctly pulls a vertical image to pin. One cool feature of Zapier is that it allows you to automatically pin from certain shop platforms when a product goes live. 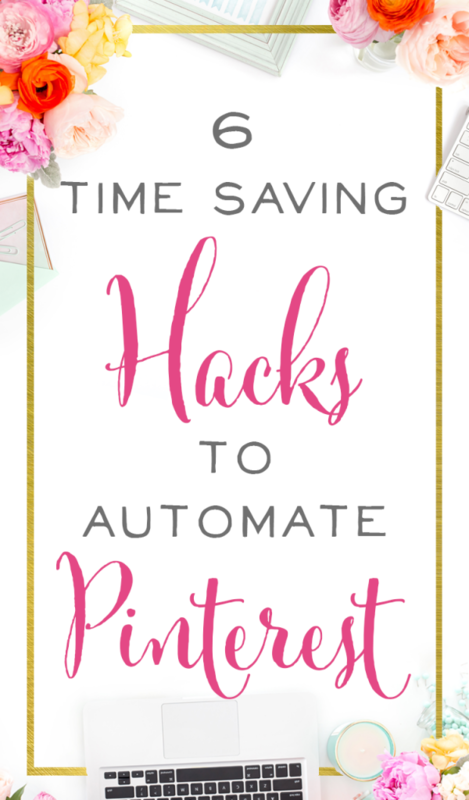 When this Zap would be good for you: If your time is limited and you have a large amount of inventory you’re adding to your shop, this Zap might be a good choice for you to help you automate your Pinterest sharing. If your shop only uses square images, this might not be the right Zap for you. And if these weren't enough, you can find a full list of Pinterest Integrations here. It’s an exciting time to be doing business! There are so many platforms to share your ideas and products, and nearly countless ways to find an audience. New technology like Zapier simplifies and automates processes and makes it easier and easier to grow your business on autopilot, saving you time and energy along the way.